Baron Helmut Zemo. I wouldn't exactly call him a "Soldier of A.I.M. ", but if this is how we get him, I'm not going to look a gift horse in the mouth. This villain has been long overdue in the Marvel Legends world. Identical packaging to the rest of the wave, except for the "Soldiers of A.I.M." bio on back. Zemo isn't actually named anywhere on the package, so the toy-buying moms and the less-initiated among the collecting ranks may have no idea who this guy is, instead thinking him some sort of flamboyant, swashbuckling, mad-scientist ninja. That's actually a fairly accurate way of describing Zemo. Like the Hydra soldier, Zemo is built on the Bucky Cap/Archangel/US Agent/Black Panther body, once again with a new head, belt and shoulder harness, and this time with US Agent's cuffed boots and gloves. So naturally, he includes all the awesome articulation that body affords him. I would have like the fur-trimmed costume just a little bit more (because lets face it, if you're going to dress fabulously, you might as well go all the way), but this is an effective recipe for Zemo and I'm more than happy with how he turned out. The newly sculpted bits, especially the head, look great. I know I've said it before, but Hasbro has really hit their stride with this line. Zemo's paint deco is mostly simple, but clean. The body is cast in purple, the gloves and boots in yellow, and the pink pinstriped mask and torso are cleanly applied with no smudging or streaking. That's pretty remarkable, considering the pinstripes. Out of all the figures in the wave that I picked up, the Zemo's were the most consistently painted. For accessories, Zemo includes his broadsword and his leopard-spotted handgun. His belt has a holster/loop that either can fit in, though neither quite comfortably. 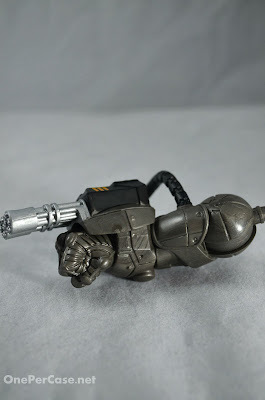 The sword is a new sculpt, but I don't believe the gun is. Both look good, but the sword seems just a little short to me. There are also two pistols sculpted into holsters on Zemo's shoulder harness, but they're not removable, so they are therefore useless. Finally, Zemo also includes the right arm of the SHIELD Mandroid Build-a-Figure, which features dual Gatling guns. Just as with the Red Skull/Hydra Soldier running change/swap-figure duo, Zemo has zero parts in common with his swap figure, the A.I.M. soldier (who's review will be up shortly after this). But the two look great together as a pair. This wave might have the best freaking swaps/variants/running changes out of the whole line. Two awesome villains AND two awesome army builders? Here is my wallet, Hasbro. Do what you will with it. Comparing Zemo to the older Toybiz Baron Heinrich Zemo, you can really see just how far Hasbro has come with this line. Now I actually want a new Heinrich. Like all non-Captain figures in this case, Zemo is packed one-per. Since he's not an army builder though (unless you want an army of fabulous pirate ninjas), he shouldn't be too hard to find, once this line makes it out in mass numbers at retail. If you want to save yourself the hassle of the hunt, you can order a case from BBTS. Zemo is a must have villain for any Legends collector, and now we REALLY need to get his Masters of Evil cronies that were slated for the still-in-limbo Jubilee BAF wave. Tiger-Shark, Radioactive Man, where are you? Words, photos, and seriously considering doing that whole army of fabulous pirate ninjas thing by Zak. Whether he is a rough and tough guy waiting to rescue his damsel in distress, a chocolate boy rolex replica wanting to woo his new found love, a loving husband fake cartier or a hopelessly romantic man wanting to do something special for his ladylove, watches are made to suit distinct individuality. When choosing a fake cartier watch for yourself, make sure that you look into certain factors. These include band material, colour, type, brand and stylistic features. fake rolex Watches for men come in a number of band materials including genuine leather, silicon, plastic, plastic and steel. Choose one depending on what hublot replica uk fits you the best and also the function of your purchase.